As a Tenkara style fly fisher I am spoiled by the embarrassment of riches at hand. Having fly fished on Vancouver Island, B.C. since 1970 I am an anomaly. That is, I have not fallen head over heels for catching that big, shiny, silver slab of a salt water salmon, to the exclusion of the great fun to be had poking about more intimate fresh waters. I find time to enjoy both. Much like the mountainous Japanese birthplace of Tenkara, Vancouver Island is blessed with countless waters particularly suited to this style of fly-fishing. 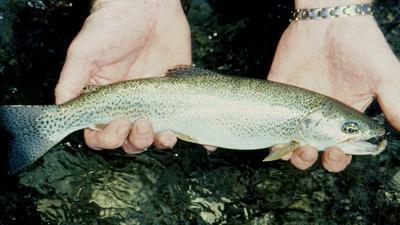 Small streams during normal/low summer flows offer good trout fishing opportunities. Streams like the Englishman, Quinsam, Little Qualicum and Elk rivers come to mind, as do many tiny mountainous headwater flows of larger rivers. There are some streams I know, where at places you can actually jump across without getting wet, which hold some surprisingly nice trout in the random deep spots. These are without exception pretty trout in pretty surroundings. This is secretive fishing in intimate surroundings. Summertime flows limit trout to specific habitats; Greenish hued pools where you cannot see the bottom. Bubbly current tongues between and behind boulders in a tumbling cascade. Undercut banks with overhanging bushes. A washed out hole in the substrate near a partially submerged log. The dark watery cavern next to a log jam. These are the prime spots to sneak up, Ninja style, and drop in your fly. 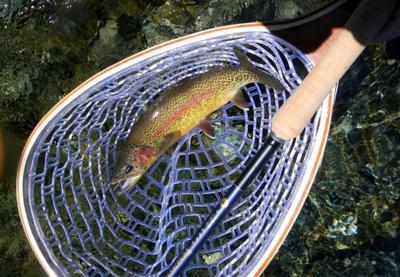 Simplicity in Tenkara style fly-fishing frees your mind to concentrate on becoming one with the environment. Dress in muted Earth tones to blend in. Move with purpose and dexterity so not to alarm your quarry. Cautiously ease into the water only when absolutely necessary. Visualize the rise before making the cast. Meld with the moment... and enjoy the surprise as the shock of reality snaps you back into being when a good trout takes your fly.